At first blush, the north-end streets of Winnipeg seem worlds away from the southern outskirts of São Paulo, Brazil. Let’s start in Brazil. Two weekends back, the Globe and Mail published an excerpt from Arrival City: The Final Migration and Our Next World, a new book by the Globe‘s Doug Saunders. 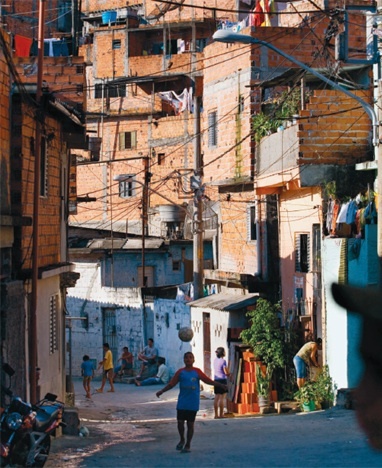 In 1996 Jardim Angela became known as the most violent community on earth … [with] an astonishing 309 homicides per year. Almost all the victims were teenagers, caught up in local gang struggles. So how did this besieged neigbourhood turn it around? Before, the police had literally been heavily armed military platoons travelling in armoured vehicles invading from fortress-like bases outside, treating the entire neighbourhood as “enemy territory” and the whole population as potential combatants. They would raid at night, arrest, kill, then leave. Drug crime was their only priority. … [Then], after years of [community] pressure … the police embarked on a truly bold experiment. They built a station inside Jardim Angela, with big windows and an open door, reduced their vehicle count to two cars for 200 officers, and devoted themselves to foot patrols, going door to door in the style of beat cops – something Brazil had never seen before. Winnipeg is almost 6000 miles away from São Paulo as the crow flies. And if you live in the city’s North End, you may occasionally feel in a world of your own compared to Winnipeg’s wealthier ‘hoods. From previous studies done in Winnipeg’s inner city we know that most inner-city residents do want a greater police presence in their neighbourhoods. But what they want is community policing where police are a positive presence and get to know the neighbourhoods and the children. Aboriginal people in particular do not want the aggressive style of policing involved in flooding the North End with cops and harassing people, because too often those harassed are guilty of nothing at all. Entitled “If You Want to Change Violence in the ‘Hood, You Have to Change the ‘Hood: Violence and Street Gangs in Winnipeg’s Inner City,” the report drew on the street-hardened insights of six active gang members. They were all Aboriginal men who’d spent time in custody and first joined gangs as teenagers. As one of the six pointed out to us, and as is obvious to anyone, there are no street gangs in [comparatively higher-income areas like] Charleswood or Fort Garry. There are street gangs in the inner city and North End. Why? Because that is where the poverty and all its byproducts are concentrated, and these are the breeding grounds, the cause, of the street gangs and their violence. Granted, none of this is an instant panacea. Pursuing such a so-called “root-causes” solution to crime would require long-term commitments and investments from all parties concerned, a term much longer than any 2-month election cycle. But if the most violent place on earth can transform itself, what’s stopping the elected representatives of Western Canadian cities like Winnipeg from engaging and enabling the same sort of transformation?